OK, I’m coming by plane, but I couldn’t help but think of that Kinks song. But Antipodean readers who may be in Perth, Canberra, and possibly Sydney — I’ll be coming your way in late August/early September. But do drop a line if it seems our paths will cross, or if you have any recommendations for those towns. Comments Off on ‘Why not get a boat and come to Australia?’. Click here to leave a comment. That phrase is taking on a whole new meaning in Nagpur, India, however. Traffic officers in Nagpur, 870km west of Mumbai, have agreed to allow small pyramids to be placed at 10 accident-prone sites in the city to see if their claimed positive energy can reduce crashes. Deputy Commissioner of Police (Traffic) Sahebrao Patil said the road safety initiative came about after a meeting with an expert in Vastu, an ancient Hindu system of construction which is similar to Chinese Feng Shui. 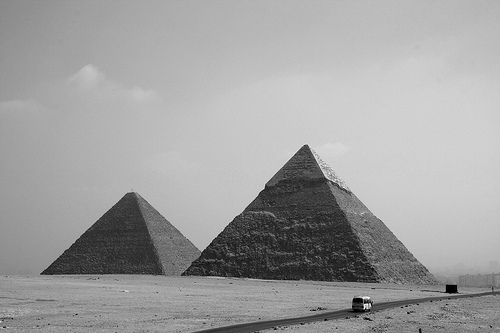 “He told me that he had placed a number of pyramids on roads outside the city and the results were excellent.The number of accidents reduced. He wanted to do it in the city, so I said, ‘OK, no problem’,” Mr Patil said. While I personally have no belief in negative energy, reincarnation, the Rapture, etc. etc., I am interested in the possible “placebo” effects the pyramids may instill in those believing drivers who drive by — similar to what Freakonomics dubbed the “Hindu traffic nudge”; religious shrines erected at crash hotspots near Simla (a version of the crash memorials erected the world over). And, after all, things could hardly get worse on Indian roads — so what’s the harm in a little positive energy? Comments Off on Negative Energy and Road Crashes. Click here to leave a comment.